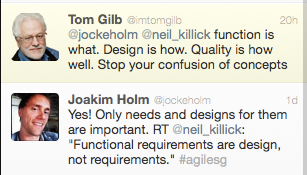 Recently, I retweeted an item from Neil Killick and I was surprised to see a response from Tom Gilb, legendary software methodologist. The tweets can be viewed in the picture below (read from bottom up). Apart from the honor of getting some of his attention, I was a bit concerned with the response. I seemed simplistic and categorical to me. Quite frankly, it sounded like something out of a schoolbook in software engineering from the 80s. I find myself in disagreement with it. To disagree with Tom Gilb is scary so I needed to write down why. If you are into User Experience (UX), you may be using effect maps, also known as impact maps or goal maps, to guide software development towards the intended effects. These maps are used to describe how your business goals will be achieved by helping important target groups fulfill their goals of using your product or service. If you are using agile software development, you are probably using user stories to describe your features for development using some common template. In this post I will suggest a new user story template, specifically designed to be combined with effect maps.